In 1984, while Theodore M. Berry was heavily involved in the battle to end racial segregation in Cincinnati Public Schools, the Cincinnati Chamber of Commerce chose him as a “Great Living Cincinnatian.” This prestigious designation by the Chamber is part of the organization’s annual honor conferred on local citizens who have made a substantial impact on Cincinnati life. Joining Berry in being honored that year was Cincinnati Bell CEO, Richard T. Dugan. Every year since 1967, the Chamber of Commerce (now called the Cincinnati USA Regional Chamber) has chosen a select few Cincinnatians as “Great Living Cincinnatians” based upon their achievement in five categories over a lifetime of work: community service, business and civic attainment on a local, state and national or international level, leadership, awareness of the needs of others, and distinctive accomplishments that have brought favorable attention to their community, institution or organization. 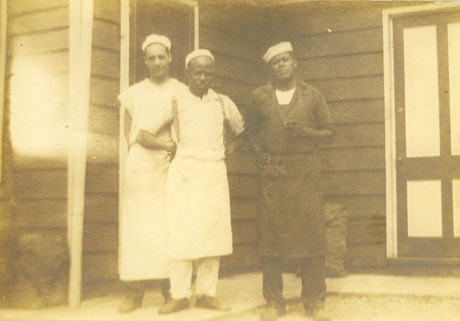 Theodore Berry is pictured here (far left) at Fort Scott Camp with friends and fellow cooks the Steel brothers in 1925. The project was sponsored by the Chamber of Commerce and the resulting experiences and findings of rampant and blatant discrimination helped guide Berry down the civically and politically minded paths which he would follow throughout his career. At some point, however, the Chamber hopped on the fair employment train and they and Berry got along well from then on – the relationship secured with the presentation of this award. 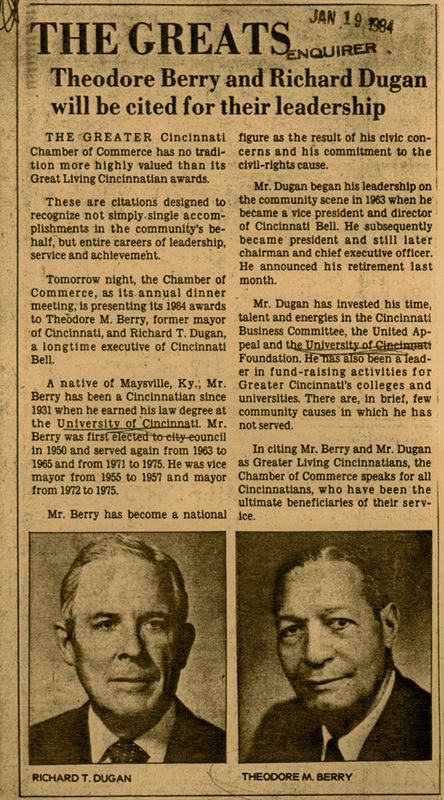 Today, Berry is featured with a short biography on the Chamber of Commerce’s website along with his fellow “Great Cincinnatians.” Since 1967, 126 citizens have been so-honored during their lifetimes. 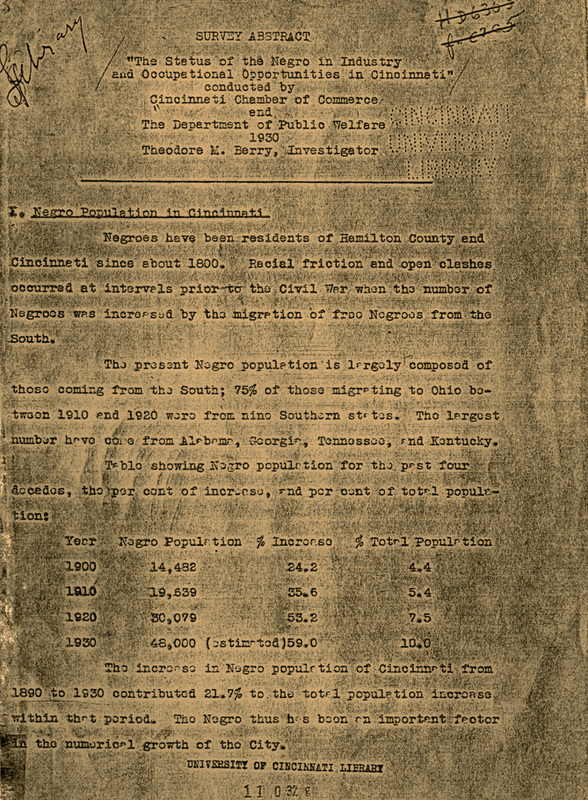 For more information please see: The Cincinnati Chamber of Commerce Great Living Cincinnatians: Theodore M. Berry (This page lists Berry’s birth year as 1906 but it is 1905. The biography states that Berry served on City Council for three terms; however, he actually served four: 1949-1951, 1951-1953, 1953-1955 and 1971-1972 in addition to his one term as Vice Mayor from 1956 to 1957, and 1 ½ terms as Mayor from 1972 to 1975) and The Cincinnati Post article, Berry: Dedicated to Rewriting Odds by David Wecker.